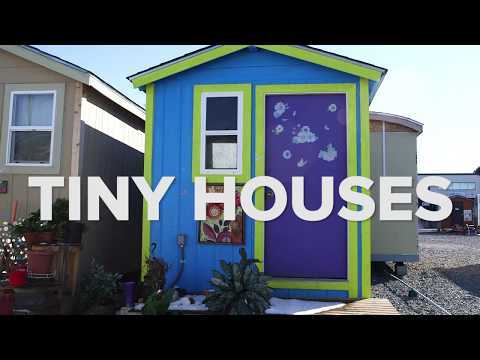 The Tiny House Villages program is an innovative solution to the problem of homelessness. The Low Income Housing Institute (LIHI), located in Seattle, develops and manages affordable housing, provides supportive services, operates free homeless hygiene centers, and develops Tiny House Villages in the Puget Sound region. Homelessness in our region continues to rise. According to the 2018 Seattle/King County Point-In-Time Count of Persons Experiencing Homelessness, a total of 12,112 individuals were experiencing homelessness in Seattle/King County on January 26, 2018. 6,298 were unsheltered, living on the street, or in parks, tents, vehicles, or other places not meant for human habitation. Seattle has the third largest homeless population in the nation after Los Angeles and New York City even though we have the eighteenth largest overall population. people in 2019, including families with children and individuals. The tiny houses have lockable doors, insulation, electricity, heat, and ventilation. The Tiny House Villages have security booths with 24-hour security, hygiene facilities, kitchen facilities, donation tents, and supportive services for the homeless individuals, families, and their pets. LIHI has been successful helping providing homeless families and individuals with safe and secure places to live while our case management staff helps them find housing, education, and other social services. In 2017 and 2018, we have served 1,767 homeless families and individuals with this program. During that time we helped 52 people move into transitional housing, 350 move into permanent housing, 136 reunite with families and friends, and 177 exit with or obtain employment.